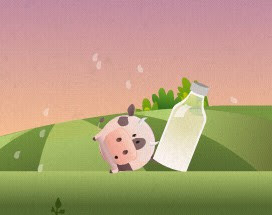 Mooo is a new physics based puzzle flash game about a rolling cow that loves to fill empty bottles with milk, developed by turbonuke. The objective is simple; roll the cow (that thing that looks like a piggy bank ;p) using left and right arrow keys to the goal point which is the empty bottle. Sounds easy but as you play further, you will be faced with obstacles that needs some thinking to be solved. The game offers cutely done art and animation with nice puzzle and physics elements too. Also, you can try to create your own custom levels using the in game level editor. Anyways, if you find yourself lost at some point or stages of this game, some dude has a Mooo walkthrough that shows how to beat all of the 20 levels in the game.